On Monday evening, I attended an event held by the Coalition of Sensible Taxpayers (CO$T) at Piatti Restaurant, entitled “What they don’t want you to know about taxes, pensions, public education and services.” David Crane, the guest speaker and founder of Govern for California, made a compelling presentation about the coming financial crisis in our state. Some of the many causes of Crane’s well-reasoned predictions included the State’s bogus accounting tricks, its imaginary investment return projections, and its skyrocketing retiree benefits and healthcare obligations. He also noted how California’s tax revenues have become lopsided and increasingly dependent on fewer and fewer super-wealthy individuals, so that the next recession promises to be long and painful and expensive. Tax revenues at the moment are riding high, so complacency and elaborate spending plans are also riding high in Sacramento. It appears that our State legislators have never seen a dollar they didn’t want to spend… immediately and for years in the future… and more than once. It’s true that the state has recently created a “rainy day fund,” but as David Crane noted, it’s a pittance compared to what will be needed when the next recession arrives and tax revenues plunge dramatically. Now, some will say, surely it can’t be all that bad. After all, the economy is booming and just look at housing prices and real estate tax revenues. They have both been skyrocketing for years. So, our state and even our county must be flush with excess cash, right? Well, sort of, but as David Crane astutely pointed out, how is it then that during this revenue boom and during one of the longest bull markets in our history, unfunded government obligations have continued to rise even while taxes and fees have also continued to rise, but the actual dollars available to pay for education and services to the public (fixing roads, maintaining parks, social services, affordable housing, emergency healthcare, etc.) have continued to fall? It’s simply because even in these times, expenses and future obligations continue to outpace revenues. This is how the state intends to put off David Crane's inevitable endgame. MTC is now unofficially the San Francisco Bay Area’s most powerful planning and housing agency. The Association of Bay Area Governments (ABAG), the former nemesis of local control seems to exist only as a consulting firm to MTC or to justify its existence and huge budget by doing “studies” and managing projects set in motion before its planning functions were stripped away by MTC. Our elected representatives who continue to sit on its general assembly and committees, effectively have little say anymore on planning and housing issues. How this “coup” of the planning and housing development funding powers of ABAG by an unelected state agency came about has been well documented in the Marin Post by Zelda Bronstein (ABAG leaders betray local cities and Regional government sells out Bay Area cities). So, since the demise of ABAG, MTC is the most important housing agency in the SF Bay Area, even though MTC has questionable legislative authority or credentials to do so. But they have the state funding and everyone else has to beg them for it, so they just took the authority from ABAG and basically dared anyone to stop them. A good question in all this is how well have our locally elected officials kept us abreast of these changes in planning decision making? But, that’s a whole other article. A case in point of this power grab is a new sub-commission of the Metropolitan Transportation Commission (MTC), our largest Bay Area, unelected, state-funded agency. It’s called CASA – The Committee to House the Bay Area. Unbeknownst to just about everyone, CASA is now the most powerful committee for Bay Area affordable housing planning, even though most of us have never heard of it nor had any say in who was chosen to be on it. Mi casa es su casa? The Committee to House the Bay Area – convenes a diverse, multi-sector set of partners in the Bay Area to identify and act upon game-changing regional solutions to the Bay Area’s chronic housing affordability challenges. Wow, it’s “diverse” and it’s “game changing.” What could go wrong? Fred Blackwell - Chief Executive Officer | The San Francisco Foundation (Bio), described on the web site as a visionary leader working to ensure shared prosperity, innovation, and equity in the Bay Area. Leslye Corsiglia - Executive Director | Silicon Valley at Home (Bio), described as “the voice” for affordable housing in Silicon Valley. Based initially in the Housing Trust Silicon Valley, SV@Home is a membership organization that advocates for policies, programs, land use, and funding. Michael Covarrubias - Chair and Chief Executive Officer | TMG Partners (Bio), a privately-held, full-service development company headquartered in San Francisco focusing on urban infill projects in the San Francisco Bay Area. I’m sure you remember voting for each of these individuals. Please don’t get me wrong, none of my sarcasm is intended to tarnish the reputations of any of these members or to even question their sincere commitment to good housing policy. But, where are the checks and balances? To whom are the majority of the members of CASA accountable? Where is representative government’s role in all this? The CASA Steering Committee includes executives from Google and Facebook, heads of well-connected nonprofits and advocacy groups and, yes, some elected representatives. But, elected officials do not represent a democratically chosen demographic and they are outnumbered 10 to 7 by unelected and politically appointed members. Worse still, their Technical Committee of advisors has 32 members, none of which are elected representatives. CASA is tasked with advancing bold solutions that match the scale of the housing crisis--solutions that protect, preserve and produce housing for hundreds of thousands of Bay Area residents. The draft CASA compact proposes a suite of big ideas that could dramatically rewrite the future of housing availability and affordability in the Bay Area. If we do this right, the CASA proposals will improve housing conditions for all residents, while also ensuring that our future moves us towards increased racial equity and fair housing and does no harm to existing communities by spurring or exacerbating the destabilizing processes of gentrification and displacement. But “right” by whose definition? I’m sorry, but this is not okay. 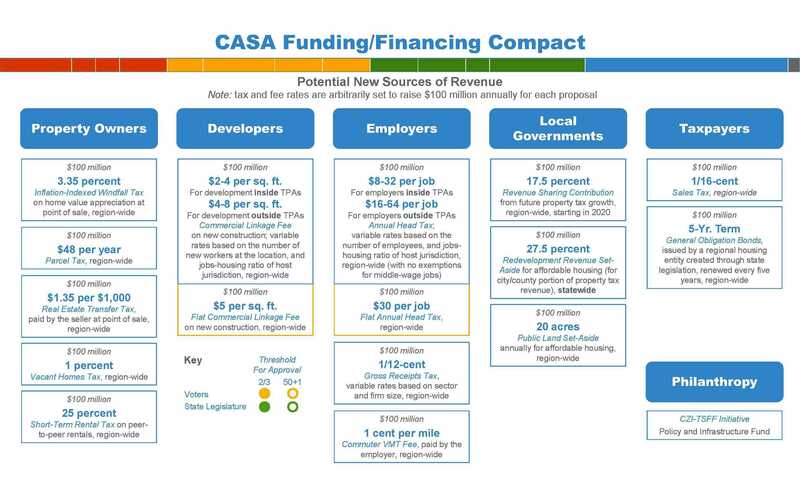 As CASA sees it, they are facing a $1.68 billion funding gap from what is needed to spend on subsidizing more housing. This is after exhausting all existing Federal, state and local funding sources, including Section 8, the Low Income Housing Tax Credit and everything else. So where does this “New Revenue” come from? In response to this challenge, their entire focus of “creative” ideas for “Potential New Sources of Revenue” boils down to more and more taxes and fees. How’s that for out of the box thinking? A 25% short term rental tax on Airbnb, etc. A $5 per square foot “Fiat” commercial linkage fee on all new construction. A 1 cent per mile Commuter VMT Fee, paid by the employer for all employees. A 20 acres of Public Land Set-Aside requirement, annually for affordable housing. Issuance of 5-Yr. Term General Obligation Bonds, issued by a regional housing entity created through state legislation, renewed every five years. SPECIAL NOTE: According to MTC, only two of these taxes and fees -- the $5 per square foot Flat Commercial Linkage Fee and the $30 per job Flat Annual Head Tax -- will require a public vote. They contend that all the others can be passed by the legislature or directly assessed by MTC, itself. So, where will all this money go? To local governments to spend on their highest priority housing affordability challenges, where it should go? According to CASA it needs to go to a new “Regional Housing Trust Fund!” – Yet another bloated bureaucratic agency run by unelected, political appointees and “stakeholder” groups that profit from its existence, who will dole out the money for their own self-interest: An agency which will inevitably be the scandal du jour ten years hence, when it’s investigated for rampant corruption and political favoritism. This is what happens where there is no public accountability and there are no grownups in the room, who understand anything about basic economics, supply and demand, and how taxes and fees negatively impact overall state economic activity and revenues, new business formation, and so much more. Time to sound the alarms! All hands on deck!